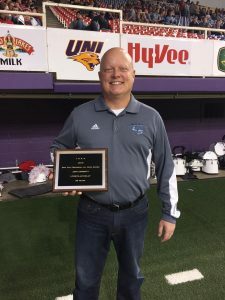 Jeff Corbett, a Lynnville-Sully teacher and coach, was recognized as the Class A Junior High Football Coach of the Year at the end of the first quarter of the Class A state football championship game on Thursday, Nov. 17, at the UNI Dome. Corbett was selected for the award by the Don Taft Junior High Coaching Award Committee after being nominated by high school head football coach Mike Parkinson. The prestigious award was developed by the Iowa Football Coaches Association to honor junior high coaches who have done an exemplary job working with young men. Corbett has been teaching and coaching at L-S since 1996 and has helped with the junior high football program since 2000. Jeff Corbett is pictured with the plaque given to him at the end of the first quarter of the Class A state football championship game on Nov. 17.